Most everyone remembers who wins. Olympic gold medalists are honored with the playing of their country’s national anthem. Rodeo athletes are interviewed after they win their respective sports. World Series Champions are honored with parades in their hometowns. Football fans watch the NFL draft each year to see who the first-round picks are so they can continue to watch their favorite college players in the pros. But have you ever watched the 12th round of the draft to see who is the 310th pick? Unless you are related to that particular football player, probably not. But not everyone can be first, and even when you are the 310th choice, you can still work hard, show dedication and become successful. That was the message former Denver Bronco Karl Mecklenburg shared the final morning of this year’s BioZyme® Dealer Retreat as he reflected on his 12 years in the NFL. The 310th pick in the 1983 draft never gave up and became a Denver Broncos Captain and All-Pro Linebacker. His career included six Pro Bowl and three Super Bowl appearances and he became one of the NFL’s most versatile players, playing all seven defensive front positions – often during one game. Mecklenburg had a dream, and he never gave up. “Success is overcoming obstacles on the way to your dream,” Mecklenburg said. Now as a motivational speaker and author, he encourages others to follow his six keys to success. 1 – Teamwork. Leadership is the ultimate expression of teamwork. As a leader if you are clear and consistent with a team commitment, the rest of your team will follow. 3 – Dedication. Don’t ever quit. If Mecklenburg had been discouraged by his 12th round pick, he might have given up and never played in three Super Bowls. If you are dedicated to your business and your customers, you will realize your potential and continue to grow your business. 4 – Desire. If you have the desire to succeed, you will work to succeed. Talent won’t get you near as far as desire and preparation. If you are getting ready to meet with a potential customer, do your homework. Find out about that producer, what makes that producer “click”, what does he or she need to make the operation more successful? If you have the desire to succeed, and put the work and preparation into your desire, you will succeed. “There is nothing holding you back but yourself,” Mecklenburg said. 5 – Honesty. The only way to make improvements is to be honest with yourself and others. You must know where you are today to know what goals to set for the future. 6 – Forgiveness. “Anyone who has lived a lot has made mistakes,” Mecklenburg said. Forgive those who make mistakes so you can keep those friendships, business relationships and support systems. It is especially important to forgive if someone admits they made a mistake. It is vital to keep these keys for success in mind – in everything you do. Today, you might feel like a 12th round NFL draft pick, but with courage, dedication, desire, honesty, forgiveness and a team like BioZyme backing you, you will be a success! Take the time. Find a way. As you look for ways to grow your business, it is important to think of everyone you encounter as a potential customer. 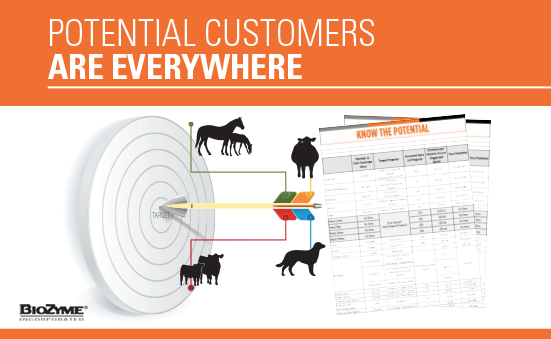 Are most of your customers cow-calf producers? It is highly likely a lot of them also have horses that need our products. Most households have 1.6 dogs, and BioZyme® offers products for our canine companions. 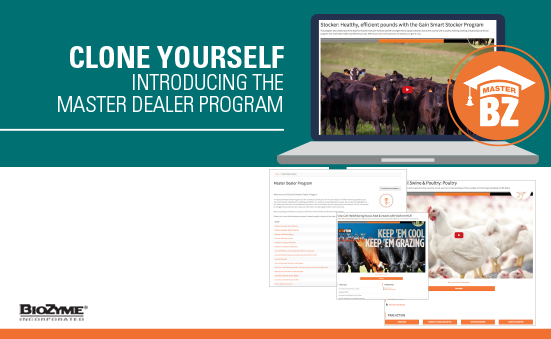 During the recent Dealer Retreat, Tell Stevens, Digital Marketing Manager, shared with dealers some big picture numbers of the potential they have in their respective areas. What most dealers discovered is they have a lot of potential they had not considered. 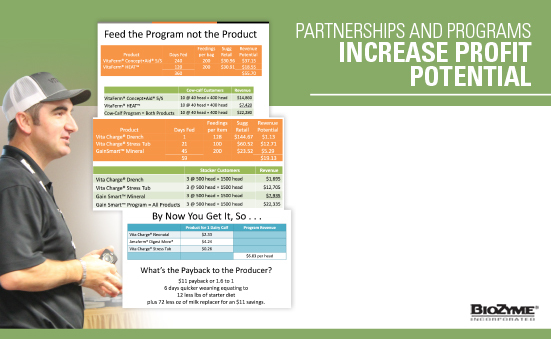 Working with the USDA to gather numbers, Stevens collaborated with Lisa Norton, BioZyme Vice President, to determine assumed days on a program and the revenue per head at suggested retail to calculate potential revenue. Numbers on the chart assume that BioZyme has 100% of the market share; however, Stevens said to compare the revenue of one segment against other segments to get a more realistic figure. For example, a horse on Vitalize® year-round, will generate $323 in revenue. Do you know someone with 10 horses? 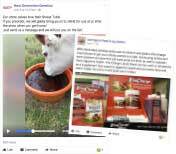 Perhaps you need to reach out to customers who buy the VitaFerm® products for their cattle and also have horses, and educate them on the benefits of Vitalize. 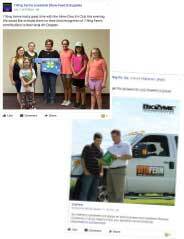 It’s a great idea to generate more revenue from those customers who already know about and believe in our products. Nearly everyone you meet has a dog. And most dog owners treat their dogs like their kids. 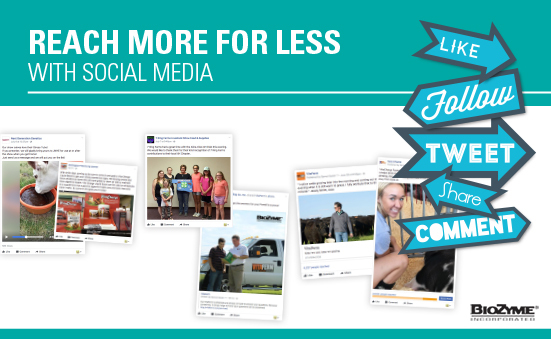 You can generate nearly $75 of revenue in a year from one dog being on Vitalize products. And that customer will likely continue to buy products from you for years to come. It is easy to get stuck in a sales routine where you talk to your same customers on a regular basis, but it is time to think outside the box and grow your potential. 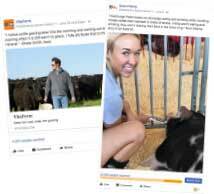 If your typical audience is the cow-calf sector and you discover a commercial poultry, swine or dairy operation exists or has moved into your area, those are great potential customers. Not sure how to start a conversation with them? Talk to your ASM or someone on the business development and support team to help you make that pitch. Take the time. Find a way. Find your potential, and grow your business. 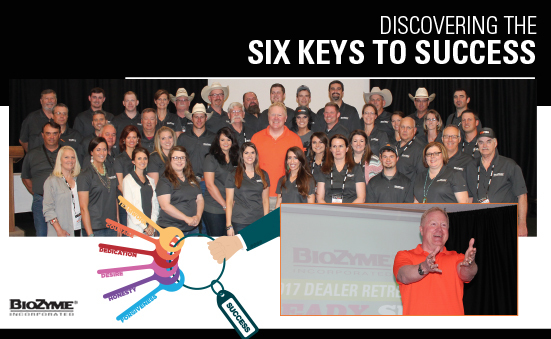 If you were not able to attend Dealer Retreat, and would like to know the potential for your dealership, contact Kristi Stevens, Marketing Project Manager, at 816-596-8795 or kstevens@biozymeinc.com.